Often, when people approach me for help with their riding or an issue with their personal horse, a greater opportunity arises. The presenting issue is frequently an indicator of something deeper and, as we work together, it turns out that the transformation people have been seeking - for their horse, for their relationship with their horse, or in their equestrian performance – has actually been for themselves. The truth is, if you want to RIDE better, you need to BE better: a better partner, and a better version of yourself. Because they are so deeply intuitive and sensitive, our horses respond to the woundedness we harbor by doing their best to wake us up to the truth: we are whole, we are perfect and we are worthy of love and happiness. When we step fully into our truest selves, it can transform our lives, our riding and our relationships with our horses. If you are seeking a revolutionary shift in your performance or your relationship with horses, Equine Gestalt Coaching (EGC) can be a deeply supportive experience on your personal journey. 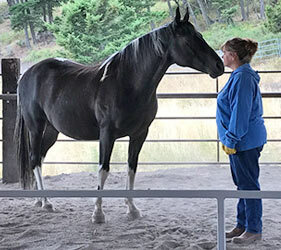 In the EGC Method, the wisdom of the horse guides the human coach and client in an experiential process that fosters alignment, emotional healing and a return to wholeness. Each session is unique and brings us closer to understanding the true nature of horses, ourselves and the special gifts of the individual horses with whom we partner. By dropping our limitations and leaning into our potential, we can create seismic shifts in the saddle. To be exceptional equestrians, we can’t simply focus on technique and athletics. We have to be exceptional, multidimensional, leaders and partners. This means taking accountability for our role in the relationship and doing our personal work; clearing out “unfinished business” that impacts our performance and connection with the horse, and finding our emotional, physical, and spiritual center. It is not enough to master the mechanics – that simply makes us riders. For the true equestrian, riding is part of a larger story – one of synergy, dynamic partnership and mastery of self. And that is why Equine Gestalt Coaching may be the most powerful riding aid you can apply. Gestalt Coaching was pivotal to my own spiritual and equestrian journey. Reaching closure on previously unresolved issues has allowed me to be more present, authentic, empowered, and joyful - in my life and with my horses. Don’t you and your horse deserve to have the same? Contact me to explore how Equine Gestalt Coaching can transform your riding, your relationship with your horse, and your life. Interested in the other programs I offer? Learn about Gestalt Riding™ and Liberty Practice™ .